Do you wish your children had the reading habit? I know I want my children to love reading because it is such an important part of education, and more importantly, learning. But how do you instill this habit in your kids? Below are 5 ways to help you make your home a place where your children love to read. I know this is not new advice, but the reason you hear it all the time is that it is so true. Reading to your children daily is one of the best ways to instill the love of reading into them, and make them life long readers. The best times to stick this activity into your daily schedule is generally in the morning or evening. I personally prefer evenings, because it allows both my children and I to unwind together after a long day, and spend some good quality time together. Many people like to read to their kids at bedtime, and I myself have some fond memories of this. However, I caution you that if you do this, don't read them anything too exciting. I know it jazzes up my kids if they hear something funny or adventurous right before turning off the lights. Therefore, I prefer after dinner time as our daily reading time. The time of day doesn't matter though. 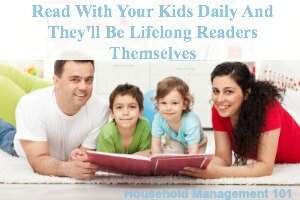 What matters is reading with your child consistently everyday to instill the reading habit. Plus, you don't have to read for hours on end each time. In fact, that is not practical. I suggest reading for 15-20 minutes a night, and only adding more time if it fits into your schedule and your child is genuinely enjoying it. One of the ways reading to your child daily can backfire is if either or both parents and children view it as a chore instead of a pleasure. You won't do it everyday if it isn't fun, and your child will not learn to love reading, but instead will hate it. So, how do you make reading an enjoyable experience so they develop the reading habit? I've got a couple of ideas and suggestions that have worked for me. Have realistic expectations of how children of various ages enjoy reading. Babies don't care about the story or the pages too much, they just want to hear your voice and be cuddled for a moment. Toddlers love silly voices, and want to ask lots of questions. Older kids want to turn the pages themselves, actually care about the story characters and may even want to know what word you are reading right then and what it looks like. You get the point -- play to your audience. Engage them and don't expect them to have a large attention span if they are very little. Create a cozy reading environment. I also suggest keeping a good dictionary near by, especially one designed for children, for those times when they ask you what a word means, and although you know for some reason you cannot articulate it at that moment. You know, when you have Mommy brain! Let them choose the book, or at least the topic, at least most of the time. Kids are more interested in a book that they chose, especially if they are interested in the topic. As long as you don't find it objectionable, let them choose to read their fiftieth book on that topic. My kids, for example, love superheroes. Therefore, we have more than our fair share of superhero books in our house, and I can tell you more than my fair share of superhero trivia. But my kids love to read them, and I think that it is important to have them develop that reading habit, however it happens. It being said that you should let kids choose topics they are interested in, you can stack the odds in your favor of instilling the reading habit in kids at a young age if you make good books available for them to read. 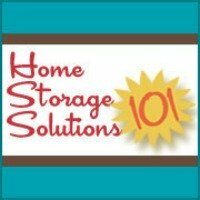 That doesn't mean, however, you have to have shelves and shelves of books in your house, although we are bibliophiles in our home so we are guilty of that. Regular trips to the library will also work for making great books available and enforcing the reading habit. And to know what books are worth checking out of the library (or to buy) I recommend checking out the AR reading list for suggestions of appropriate books for your child's reading level, and checking out recommended reading lists that people have compiled. One of the best ways to instill the reading habit in your children is to give them the building blocks necessary to learn to read. After all, you will never enjoy doing something, like reading, unless you can do it competently. One of the best articles I have read about how children learn to read was in Slate Magazine, Reading Isn't Fundamental: How to help your child learn to read, by Dr. Alan E. Kazdin and Carlo Rotella. In addition, talking to your children and exposing them to a large vocabulary (such as through books) is also important. Also, it is important to discuss the book with your child as you read it to them, or as they read it to you as they get older. That includes asking what to adults are some pretty boring questions, such as looking at the pictures and identifying parts of the body, or colors, or animals. It also includes questions like, what is this person doing or feeling? What do you think will happen next? Etc. Further, don't worry that your child is getting into a rut because they want to read one book over and over again. In our house, that is, In a Dark, Dark House . My kids love it and have it memorized, but it is still a favorite request. According to Dr. Kazdin, "It's fine to read the same books over and over, as many children like to do. Research indicates that repeated readings help a child to integrate words better; comprehend meaning; and connect sounds, words, and meaning." Good to keep in mind when you are reading the same book over and over! To break up the monotony for you, the article also suggests asking questions even after multiple readings. It helps you stay engaged with your child. And bonus, this helps your kids learn to read, and get the reading bug! 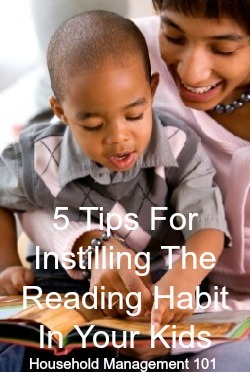 My final suggestion for how to instill the reading habit in your children is to model the behavior yourself. Show them how you love books, and they will too. It isn't fair to expect your children to read daily if you don't. So read daily, even if it just a magazine, cookbook, or a website on the computer. I know that when you have little kids it can be hard to find the time, but it is well worth it for your own sanity, and also provides a good example for your kids. So, those are my suggestions for how to get your kids in the reading habit, but I'd love to hear from you too. Please tell me in the comments below your routines and reading rituals with your kids, or how you've tried to instill the love of learning in your own kids. In addition, if you've struggled with this, I'd love to hear your experiences and thoughs about this too! Does A Messy House Keep Your Kids From Learning To Read?